The 2016 fourth generation Mazda MX-5 debuted to much applause. 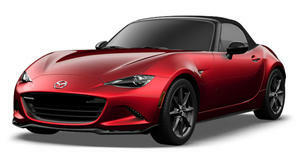 The new Miata aligns with Mazda’s original goal of a light roadster with excellent driving dynamics. Mazda even took a risk by giving the Miata a more aggressive look, more akin to the Honda S2000 than the previous generation. However, despite the new aggressive looks, the 2016 Miata actually loses power compared to its predecessor. Still, having driven the new Miata we can tell you that the 2.0-liter four-cylinder (good for 155 horsepower) does more than enough to motivate the 2,200-pound roadster. While the SkyActiv four-cylinder engine likely won’t raise any eyebrows from Corvette owners, it can propel the MX-5 to 60 mph in just 5.9 seconds. Fans of the second generation MazdaSpeed Miata will quickly ask why Mazda doesn't just drop in a turbo. While Mazda has denied plans to build a MazdaSpeed version of the new Miata, Fiat has got the speed junkies covered. The new Fiat 124 Spider will be built on the same platform as the new MX-5 and will share the same interior but have nicer materials. Under the hood and on the exterior is where the new Fiat begins to depart from its Mazda twin. The exterior features a hexagonal grille, a power-dome hood, and rounded rectangular headlights. Under the hood is where the Fiat 124 really gets interesting. Featuring a smaller 1.4-liter turbocharged four-cylinder engine, the 124 will have 160 hp and 184 pound-feet of torque. This might not be a huge jump over the Miata’s 155 hp and 148 pound-feet of torque, but the advantage in sound is where the 124 will make you smile. If you have ever played the game of "put your dream engine into a car" you may understand what the Fiat 124 means to the roadster market. The Miata has always included “just some engine.” The Miata recipe has always involved taking whatever engine was currently in the automaker's current small sedan and making some minor adjustments. The Miata was always lightweight, so this formula worked out. It simply did not need a special engine. However, just imagine how fun the it would be if it featured the soundtrack from the Fiat 500 Abarth. 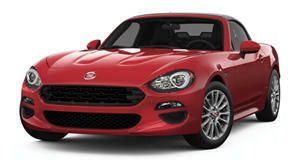 This would combine the Miata’s nearly perfect driving dynamics with the passion of an Italian exhaust note. Being turbocharged, the 124 has room to get more power either through tuning or a later Abarth version.We already know how special this engine can be when given to the crazy engineers at Abarth who ship the car without a muffler. Here's hoping that same magic carries over into the 124. Even if it doesn't the roadster will give Fiat's US arm a much-needed dose of variety. You can't just continue to sell different 500 trims, guys!